He is that tall. My T-shirt is from back in the days of walking precints for Congressman Lane Evans and state senator Obama who was running in the primary for the US Senate. I'm sure he wore that same blue-grey shirt way back then too. 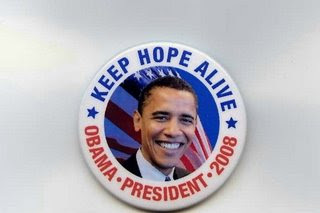 First Obama for President Pin? My wife and I attended the reception after Obama was sworn in to the US Senate back in 2005. I had ordered this button and had them delivered to our hotel. The buttons didn't show up until the afternoon but I was able to present one to his wife Michelle. I believe the date was 4 Jan 2005. Can anyone beat that date? His smile is genuine and he is genuine! He has seen the car before but this is the first time he saw it with the Obama 08 decals. Former Clifton resident, Rich Miller, is making national news with his Obamalac, a 1963 Cadillac convertible he has decked out for Senator Barack Obama’s campaign. Miller, who calls himself "The REAL Rich Miller, is the father of syndicated columnist, Rich Miller, whose "Capitol Fax" appears in The Advocate and many other Illinois newspapers. The elder Miller became an Obama fan after hearing him speak on the campaign trail leading up to his election as Illinois Senator. Miller has since taken the Obamalac to several midwestern political rallies. The vehicle, a head-turner, has appeared in The Washington Post and New York Times. Not to be outdone by his journalist son, the elder Miller also has an Internet blog at obamalac.com .